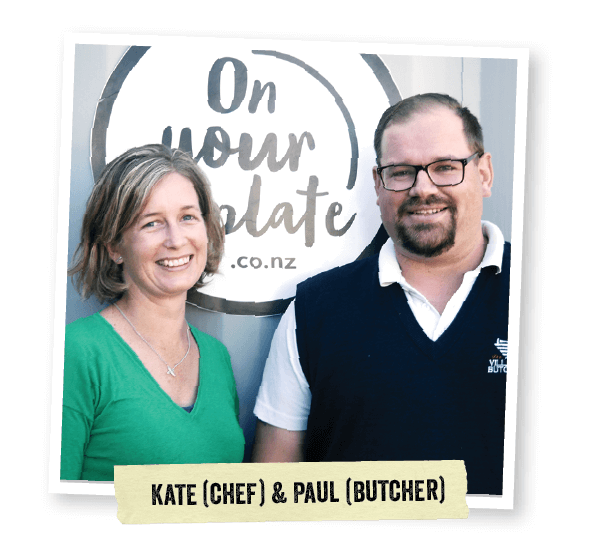 On Your Plate is a partnership between a butcher and a chef, combining their passion and talent to bring you the ultimate free range meal inspirations with a focus on quality, freshness and most of all supporting our amazing local producers of the finest products. Here are Kate's creations for the week. Delivering on Sunday the 28th of April. Autumn Lamb Stirfry with Te Mata Mushrooms, Eggplant & Orange. Mexican Grilled Chicken Thigh Fillets with Crunchy Salad & Sweet Pumpkin. Free Range Pork Schnitzel with Apple & Green Cabbage with Potato & Parsnip Mash. Creamy Beef & Tomato Sauce with Danny's Fresh Pappardelle Pasta. How many nights per week would like us to take care of? Choose from 3, 4, or 5 nights. Catering for either 2 or 4 people (these are generous, so enough for left overs or little ones). Choose a box that works for you and your family. You choose how many nights worth of meals you would like, and for how many. Catering for either 2 or 4 people (these are generous, so enough for left overs or little ones). Choose from 3, 4, or 5 nights. Go to 'Order Your Box' and order a one-off box or subscribe weekly or fortnightly. Orders made by 10pm Monday will have their meals delivered on the Sunday afternoon. We will deliver your fresh produce and recipes to your door on Sunday afternoon. Pick up is also available from The Village Butcher on Joll Road in Havelock North. Click here to see if you are in our delivery area. You cook up a storm with the freshest, free range produce following Kate’s simple and always tasty recipes. When is the order cut off for Sunday delivery? Due to the labour intensive nature of what we do, and to ensure our suppliers have enough time to pick and deliver the freshest and best produce to us, the cut off for each week is 10.00pm Monday. This is the latest we can possibly accept your order and payment. If payment isn’t made by this time, we will consider your order unconfirmed and any payment made after this time will be carried over to the following week. I’d like to order a one-off, will I have to commit to a subscription? You can order a one-off, or choose to have a weekly, or fortnightly set up, whichever way you’d like. How will I know what the weeks menu will be? We update our facebook and web page every Tuesday with the next weeks menu. You will also get an email to let you know.